A dramatic concert saluting the life and work of legal pioneer Ruth Bader Ginsburg in celebration of her 25 years on the United States Supreme Court. 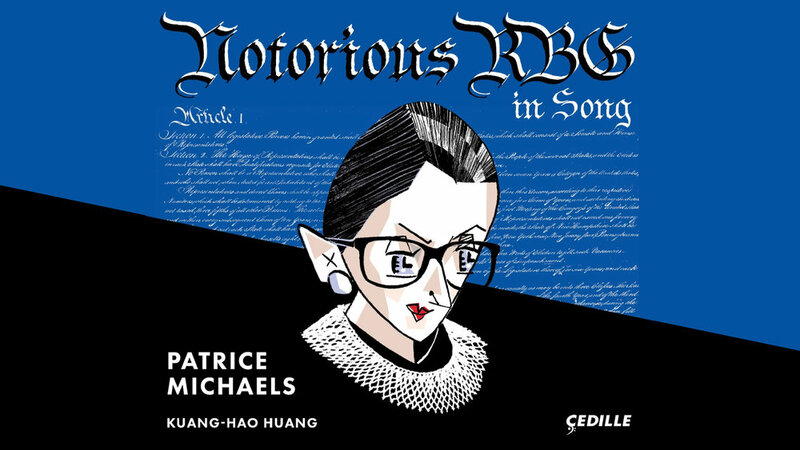 Soprano Patrice Michaels and pianist Kuang-Hao Huang offer a collection of songs saluting U.S. Supreme Court Justice Ruth Bader Ginsburg on her completion of 25 years on the high court on Notorious RBG in Song, a new album from Cedille Records. A longtime crusader for equal rights, Ginsburg has become a pop-culture icon known to her fans as “Notorious RBG,” a wry nod to the late rap artist The Notorious B.I.G. Notorious RBG in Song 2018, features works by five contemporary American composers celebrating Justice Ginsburg’s family and professional life. These include Michaels’ THE LONG VIEW: A Portrait of Ruth Bader Ginsburg in Nine Songs; Lori Laitman’s “Wider than the Sky”; Vivian Fung’s “Pot Roast à La RBG”; Stacy Garrop’s “My Dearest Ruth”; and Derrick Wang’s “You Are Searching in Vain for a Bright-Line Solution.” All but two of the songs — “Anita’s Story,” now incorporated into Michaels’ song cycle, and “Wider than the Sky” — are world-premiere recordings. Michaels, who conceived the album, studied composition with Dominick Argento and others, but put aside this creative pursuit in favor of a classical singing career — until recently. The album’s centerpiece is her cycle, THE LONG VIEW, which reveals key aspects of Justice Ginsburg’s personal life and career through letters, remembrances, conversations, and even Court opinions. Michaels’ extensive research to construct a concise but detailed narrative was aided by her unique relationship to the subject: she’s married to Justice Ginsburg’s son, James, founder and president of Cedille Records and the album’s producer. The cycle, which draws on jazz rhythms and harmonies within a contemporary classical context, opens with a song based on a text written when the future jurist (b. 1933) — and second female justice in Supreme Court history — was ten years old. It’s a 1943 letter from Supreme Court Justice William O. Douglas to a law school dean that envisions a day when a woman might conceivably qualify as a law clerk at the Court. Subsequent songs portray Justice Ginsburg’s inspirational mother Celia Amster Bader; life-loving father-inlaw Morris Ginsburg; ever-supportive husband Martin D. Ginsburg; and Anita Escudero, a typist who experienced a political awakening in the course of transcribing trial lawyer Ruth Bader Ginsburg’s handwritten notes. Later songs depict telling incidents from the childhoods of Justice Ginsburg’s daughter, Jane Ginsburg, and son, James. The penultimate song highlights key portions of some of the jurist’s most influential dissenting opinions in Supreme Court cases. The final song offers Justice Ginsburg’s philosophy on the role of law in American democracy and candid observations on the job requirements of her position. Prolific art-song composer Lori Laitman’s setting of the Emily Dickinson poem “Wider than the Sky” wasn’t written for Justice Ginsburg, but it was performed at her 80th birthday celebration along with three works the Ginsburg children commissioned for that celebration: Michaels’ “Anita’s Story” and the songs heard after Laitman’s on the album. JUNO Award-winning Canadian composer Vivian Fung’s humorous “Pot Roast à la RBG” provides a glimpse into the Ginsburg household evening routine circa 1970, archly related by daughter Jane. Stacy Garrop has received awards from the Fromm Music Foundation, Barlow Endowment, Detroit Symphony Orchestra, and other prestigious organizations. She based the extraordinarily touching “My Dearest Ruth” on the farewell love letter the Justice’s husband, Martin, wrote shortly before his death in 2010. Composer, lyricist, and librettist Derrick Wang has received awards from musical organizations including ASCAP and BMI. The aria “You Are Searching in Vain for a Bright-Line Solution” comes from his 2015 one-act comic opera, Scalia/Ginsburg. The aria cites Justice Ginsburg’s views on interpreting the U.S. Constitution while traversing varied musical genres: operatic quotations, jazz waltz, and gospel.